Prismacolor first began in 1938 and was known as the 'Eagle Pencil Company' which was then changed to Berol in 1969, the Newell Company merged with Berol in 1995 which made Berol a branch of the Sanford Corporation. Sanford UK is an amalgamation of 6 companies and sold the Karisma pencil which was the British version of the Prismacolor pencils, sadly Karisma pencils were discontinued in 2001. ​I decided to purchase a small tin of Prismacolor Premier after seeing so many people using them, many giving rave reviews and producing some amazingly vibrant and detailed pencil work. I personally love these pencils - they remind me of an Oil pencil (if ever there was such a thing, a little like those wax crayons I used as a kid) they are so thick and buttery and they blend wonderfully with the pigments being as vibrant as the 'leads' appear, my main issue is both with the poor lightfast qualities of many of the colours and ongoing quality issues which puts me off using them in any of my work. I shall keep an eye out for an improvement in these issues and if both improve, my Coloured pencil collection may just grow a little more because I really do love the wide range of colours they have. ​​Softer pencils are more likely to break by their very nature and you may find that it works better by sharpening to a shorter point rather than a longer one, as a longer lead can put on extra pressure, resulting in more breakages. Find out more about this by clicking the link below. Before deciding on a Coloured pencil range knowing that I may end up spending a lot of money on something unsuitable I always run an online search first, especially to find out the lightfastness of the colours and was saddened to see so many of the pencils have poor lightfast qualities. ​​This means if you are creating professional pieces of Art, especially for paying customers, using colours that aren't lightfast means your work is going to fade far quicker. My personal view would be to only use the most lightfast ones (I & II), which leaves me with 84 out of 150 so then what is the point of buying a full set? Well, you could create original pieces of art simply to produce prints from but never sell the original, or you could protect the finished Artwork firstly by spraying with a Fixative that has a UV filter (such as Loxley (UK) or Krylon (USA)) and then have it framed using Tru Vue glass (museum quality) an expensive choice as the glass can be just as expensive as the frame itself if not more) but this will help protect from premature fading. Any pencil range that offers a wide selection of pastel tones and a wide selection of brown and grey tones will always attract my interest as these are the colours I use the most. The beiges, peaches and pinks are great for skin tones and the larger a collection of browns and grey tones, the better. 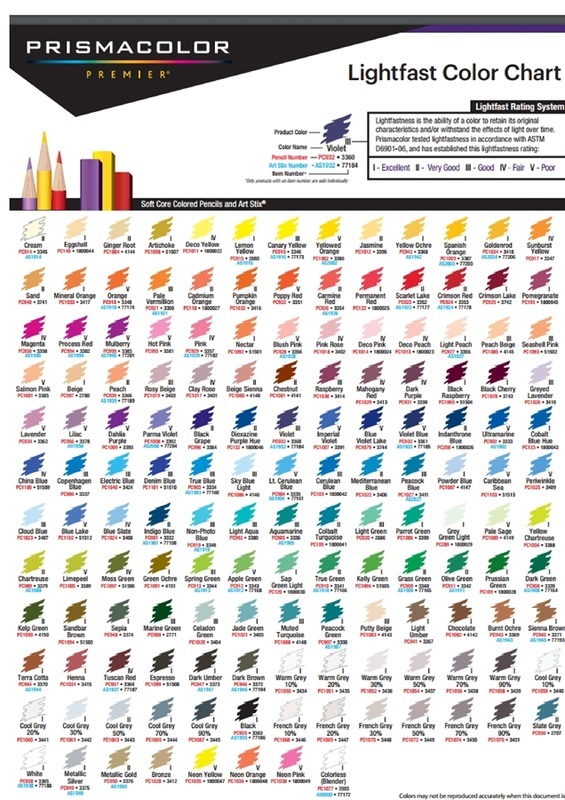 I am happy to see that the browns and greys offer the best lightfast qualities too which is particularly good for a Pet Artist as these tend to be the most used colours, however the worst lightfast culprits tend to be the Blues, purples & Pinks so do be aware before using these colours on large sections of a drawing on which the original will be sold on unless it is sufficiently protected with UV glass. Prismacolor pencils are great for blending, possibly one of the best I have tried as they are so pliable. The image below shows how the colours blend into each other rather well if using the Prismacolor blender and gives you an idea of the strength of the colour too.